Posted on Wed, Nov 30, 2011 : 5:59 a.m. First-year Michigan coach Brady Hoke is among the leading candidates to be named the Big Ten Conference Coach of the Year today. The Michigan football team has returned to double-digit wins, Big Ten contention and national relevance. It beat rival Ohio State for the first time since 2003. All in less than a year's work for coach Brady Hoke. For that effort, senior center David Molk said Hoke deserves to be named Big Ten Coach of the Year, which will be announced by the league at 2 p.m. today. "He deserves it," said Molk, who on Monday was named the Big Ten's Offensive Lineman of the Year. "I love him, he's a great coach, he's a great mentor, he's a great friend. "He's every single thing you want a college coach to be, and he does it flawlessly." 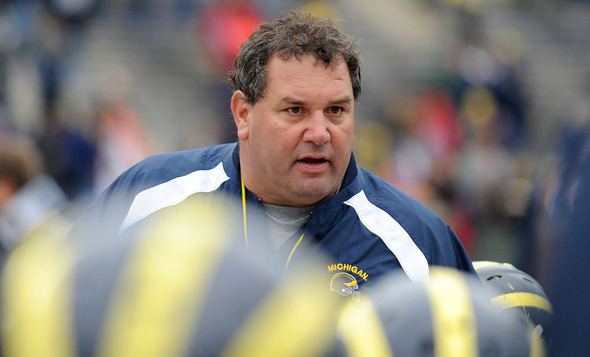 Hoke was hired in January to replace the fired Rich Rodriguez, and has taken the program to heights it hadn't seen since the Lloyd Carr era. The Wolverines' record is 10-2, their best since 2006. They had a winning Big Ten record for the first time since 2007. And, they've secured a top-five recruiting class for next year. Hoke also lured defensive coordinator Greg Mattison from the Baltimore Ravens, and Mattison, who is Hoke's best friend, immediately turned the country's 107th scoring defense into a top-10 group. All that comes on the heels of a miserable three-year run by Rodriguez, when he went 15-22 and won only six Big Ten games. Hoke matched that total in his first year, going 6-2. When asked whether he deserved to be named the league's coach of the year, though, Hoke only would praise the staff that helped make his success possible. “Any type of awards that are given, whether it’s the Heisman Trophy or best taper -- if you’re taping ankles -- we have a great staff and we have a great group of kids," Hoke said. Michigan State coach Mark Dantonio. Hoke's biggest competition for Big Ten Coach of the Year probably is Mark Dantonio, who guided Michigan State (10-2, 7-1) to its second consecutive 10-win season, a Legends Division championship and a berth in the league's first title game. It will play Wisconsin at 8:17 p.m. Saturday (FOX). Dantonio also led the Spartans to a 28-14 win against Michigan on Oct. 15, their fourth consecutive victory against the Wolverines. Also being announced today will be the Big Ten's offensive, defensive and freshman of the year. Quarterback Denard Robinson, looking to repeat as the league's offensive player of the year, likely is Michigan's only candidate for these awards. Although he led the Big Ten in total offense, Robinson still is a long shot to beat out Wisconsin tailback Montee Ball, who has rushed for 29 touchdowns and has 34 overall, five off Barry Sanders' NCAA season record. Voting for coach, offensive, defensive and freshman of the year was conducted Sunday and will be announced by the Big Ten this afternoon. There will not be an awards show on Big Ten Network. For more on Molk, Robinson, Mike Martin and Taylor Lewan being named all-Big Ten, click here. Wed, Nov 30, 2011 : 8:08 p.m.
Kyle is probably preparing report right now, But Brady has been elected Coach of the year in the B1G !! Congratulations Brady for your BO Like season,and being a Michigan Football Coach. Thu, Dec 1, 2011 : 3:51 p.m.
@Blu-dogg97 I'm not sure I understand your response BLu. Ar you trying to tell me that Hoke has clearly done a better job than Meyer this year ? You will get a good argument from not only Ohio fans , but Michigan fans as well that say this award could just as well go to Meyer. Wed, Nov 30, 2011 : 7:43 p.m. Although Hoke did a great job this year , I feel that Coach Meyer is more deserving of it. He technically is their coach right now and it seems though he has already turned the Ohio State program around. Wed, Nov 30, 2011 : 8:09 p.m.
Ted you really got to get a grip here,did you take your meds today.. ? Wed, Nov 30, 2011 : 7:41 p.m. He just won it: <a href="http://www.mgoblue.com/sports/m-footbl/spec-rel/113011aaa.html" rel='nofollow'>http://www.mgoblue.com/sports/m-footbl/spec-rel/113011aaa.html</a> Congratulations to Coach Hoke for a great year! Wed, Nov 30, 2011 : 6:41 p.m. It's nice to get recognition, but if it was between this and winning whatever bowl game Michigan goes to, I think everybody would choose the latter. Wed, Nov 30, 2011 : 7:04 p.m.
Oh, absolutely ... no question about that. And Hoke would be the first to say that. And supposing Hoke does win this I'm sure he'll deflect the attention to first the team, and then to the other coaches. Wed, Nov 30, 2011 : 6:22 p.m. Wed, Nov 30, 2011 : 7:05 p.m.
Do we have another chapter of the MCC forming here? :-) I'll tell you what ... the more I see of Hoke, the more I think long-term he's going to be looked upon as another icon of the college coaching profession. Wed, Nov 30, 2011 : 6:17 p.m.
Hard to deny COY to Hoke based on the substantial turnaround of the team (though there are those that insist RR would've done better this year). After coming back from a heart attack last year, Dantonio took his squad through the toughest schedule in the B1G, obtained a couple of quality road wins and ended up with only one conference loss. Hoke is probably in the driver's seat to get it, but you can't complain if the guy in EL was to walk away with it. Go BLUE &amp; Go HOKE! Wed, Nov 30, 2011 : 6:34 p.m.
btw...good luck to your team this Saturday. Wed, Nov 30, 2011 : 6:25 p.m. Seriously. You mean the guy in EL that watched his thugs live then on video and said - &quot;I saw no dirty play'....right, let's also give him the humanitarian award. Seriously ? Wed, Nov 30, 2011 : 4:22 p.m. He should get this award. He did more with less than any other coach. I thought they'd win 8 games max and that was being optimisitic. He showed me how wrong I was. Wed, Nov 30, 2011 : 6:26 p.m. I like that, &quot;...did more with less...&quot;. Very good. Wed, Nov 30, 2011 : 4:07 p.m.
Yeah, what about Urban Meyer? After all, didn't someone just HIRE him? LOL~! 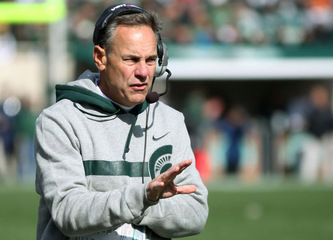 There's a real factor in picking Hoke over Dantonio: Dantonio was hired by MSU on Nov. 27th, 2006. So he brought the Spartans up to par only after FOUR years of effort (and after forgiving who know's how many player arrests?). And as I've said many times, looking back, the first thing you notice is that MSU teams only shine during the rare (every 40 years or so) times when Michigan is in a down period. Coaching is also highly dependent on the &quot;age&quot; of the team: having a majority of seniors on any given team is the usual &quot;peak year&quot; for every team. Dantonio has done a good job: but all he's really done is to produce what would normally be expected. Contrast Dantonio's cycle with Brady Hoke's and it's crystal clear that all Hoke had to do was show up at Michigan to create immediate change. The magnitude of taking a bottom level team composed mostly of (much criticized) sophomores to a top-20 team of mostly (highly praised) juniors in one year is what's impressive. Just sayin' - If Brady Hoke is the legit Big 10 Coach of the Year (and he IS), then Dave Brandon is the legit Big 10 Athletic Director of the Year. Wed, Nov 30, 2011 : 4:05 p.m. The poll has the named options as Hoke, Dantonio and Bielema. But it's really between Hoke and Dantonio. Wisconsin's season has to be labeled as a disappointment, even if they win the Big 10. They have as complete a team as the Big 10 possesses and *should* have gone 12-0. The BCS talk right now should be LSU vs. Wisconsin. Had Wisconsin run the table, they'd be ranked #2 right now. But Bielema has this maddening habit of forgetting what his team's strengths are and trying to mimic what the other team is doing. Hoke vs. Dantonio -- the issue boils down to the selection criteria. Dantonio's case is summed up like this -- we came off a great 2010 and repeated in 2011. Consistency is worth something. Hoke's case is summed up like this -- we took a team in disarray and forged it into a 10-2 team in one season. Consistency vs. Turnaround. What's the criteria? Personally I'd vote for the Turnaround candidate. But then again, I'm just a *little* biased. Wed, Nov 30, 2011 : 8:20 p.m. I like your posts Don, you seem to have a good understanding of college football and not limited to the love or hate of M's coach. Wed, Nov 30, 2011 : 6:31 p.m.
Don &amp; Heartbreak...good points. I think with all the criteria present it would have been hard to pre-season rank wisky any lower. And I believe if wisky was a bad road team, that reflects on the coaches ability to motivate. Yes, we are all a little biased I'm sure - but I see Hoke running away with this award. Wed, Nov 30, 2011 : 4:34 p.m.
@heartbreakM -- maybe Wisconsin was overrated, but I'm not so sure. With the addition of Wilson they replaced Tolzien with a seasoned QB that had the mobility previously lacking. I think Wisconsin lost some key defensive linemen to the NFL, but beyond that I didn't detect there was a real weak spot in their armor. Wisconsin should not have lost to MSU ... it should never have come down to the hail Mary pass. I'd have to go back and re-watch that game, but if my suspicions are correct MSU ran a bit of an up-tempo game and Bielema countered with the same. Wisconsin did the same against TCU last January in the Rose Bowl. And there's *no* way Wisconsin should have lost the OSU game. Maybe you're right ... maybe Wisconsin is simply a bad road team. That seems to be common in the Big 10 this year. If so, that doesn't bode well for the bowls ... because even if they're &quot;neutral&quot; they're not the familiarity of home. Wed, Nov 30, 2011 : 4:19 p.m. Wed, Nov 30, 2011 : 3:15 p.m. Even if Brady doesn't get the award, he is the Coach Of The Year in all of the players and the fans eyes. Next year is going to be so much fun to watch. Go Blue, This is Michigan! Wed, Nov 30, 2011 : 2:11 p.m. Wed, Nov 30, 2011 : 1:55 p.m.
For improvement from the previous season, Hoke and his entire staff have earned this award. Wed, Nov 30, 2011 : 12:35 p.m.
@DDOT1862, and just where do you think the credit goes? He's aiready said his staff and the players. Undoubtedly he means RRod. Which I suppose is fitting as RRod and his defenders blamed everyone but RRod for his failures, they are now demanding credit for somebody elses success. Wed, Nov 30, 2011 : 12:30 p.m.
Come on, everybody. It's St. Urban Meyer for coach of the year!! Wed, Nov 30, 2011 : 12:08 p.m.
Let's hope he gives credit where credit is due- if he wins. Wed, Nov 30, 2011 : 8:29 p.m. Absolutely Hoke will. Unlike the last several years, it's never been about him, but the players and the program. Wed, Nov 30, 2011 : 2:48 p.m. I am certain he will give proper credit - to his team including the students and coaches. In the press conferences I have seen him give, never have I seen him take any glory for himself. Hoke is about the team. He restored respect to the Big House and has brought his team together to once again be winners and be proud of how they present Michigan and the University of Michigan in particular. Wed, Nov 30, 2011 : 2:32 p.m. It must be rough, being an adamant Rodriguez supporter, seeing your team win 10 with a shot at a BCS Bowl, only to be unable to enjoy it due to bitterness. As a Rodriguez Michigan fan, do you hope for Michigan losses to prove you're right? Sad. Wed, Nov 30, 2011 : 11:54 a.m. He definitely deserves the title! What a great come back for the fallen Wolverines. Brady knows how to maintain his composure off and on the field as was proven in his many press conferences, especially with the scrutiny about JoPa...Brady's only concern has always been his players and his team, and not about him whatsoever. What a great guy! So glad to have respect back in the BIG HOUSE!!! !